In the past two weeks I’ve seen something on social media that’s got me a bit ruffled. It’s no secret that moms love Target. Ok, really, what human doesn’t love Target. But there’s just something about those $5 baby clothes that makes it gold in there. Lately though, the good old Target run is getting a bad rap. And while I understand that if a Target run for you, is a means to escape life, or a place that you can’t go into with out spending a ton of money on frivolous things, it would be a bad thing. Here’s where my beef comes in. Sometimes it feels like one persons stronghold, should be everyones. That if someone with a substantial amount of followers says they don’t like Target, then everyone seems to get that opinion. It’s kind of like, we just go along with it because it might be the popular opinion. I’m not ashamed to admit how much I love Target. Or my Target runs. For me, it’s this sweet time with Em. 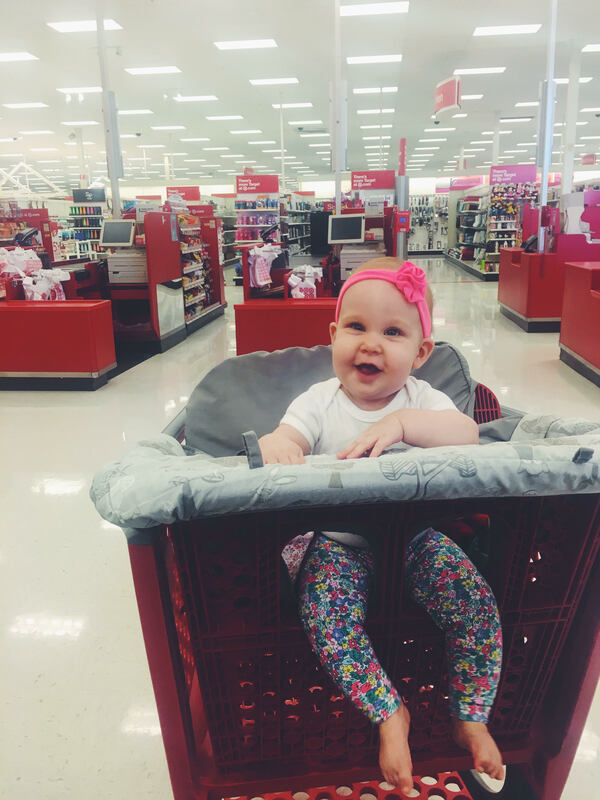 She’s old enough to sit in the cart like a big girl now, so she just looks up and smiles at me the whole time. I’m almost in tears writing this because I love our trips so much. 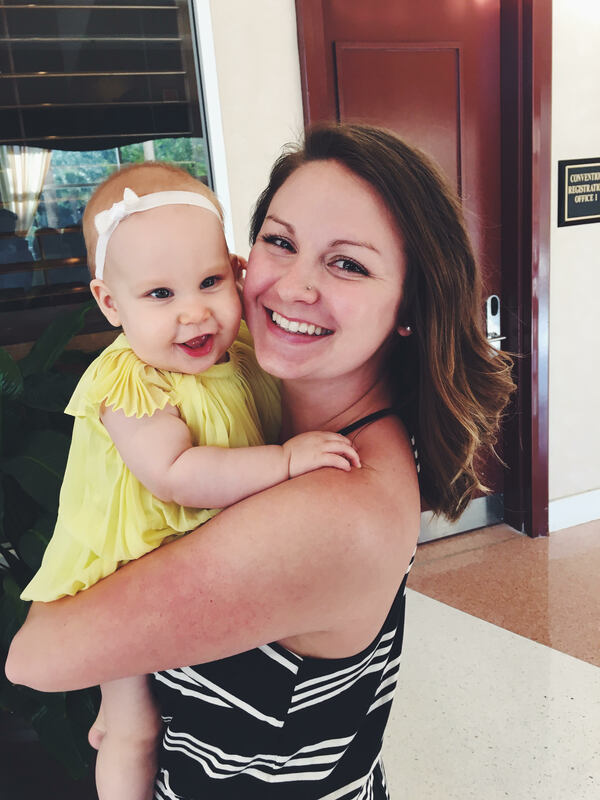 There’s also the perk of not looking like a crazy woman while talking to myself, because you know…a seven month old is quite the conversationalist. I don’t go into Target and spend money we don’t have on things we don’t need. Ok. Maybe I get the occasional office supplies, but doesn’t everyone need 10 note pads lying around? Target is our go to for everything, except groceries (we heart Publix). Diapers, wipes, toothpaste, dog treats, dog toys, baby clothes. Again, I will state. I understand that for some people a Target run can be looked at in the negative. And that’s where my biggest problem is. Why is it that one persons opinions have to be the masses? Why should I give up something that I love, because it’s a negative in your life? That’s my issue with social media these days. We’re so concerned with making it look like we have it all together like she does, and we miss out on our own lives. I truly we believe we live in a society that if we aren’t careful, is going to explode sometime soon. I feel like there’s this constant demand to have it all together. And not just as a mother, but as a human. We see Instagram accounts with perfect pictures, read Tweets wondering why we didn’t think of that first, and see Facebook statuses that cause a pain of jealousy we didn’t know existed. Comparison is indeed the thief of joy. I can’t won’t sit here and say that I think Target runs are bad. Because I don’t. I can sit here and say that it’s a part of the week that I love. Em and I spend all day together (which is the biggest gift God has given me), so when we do little trips to the store or the park, it means so much to me. And I’m kinda over being made feel guilty about it. That’s the thing. We’re loosing the “you do you” attitude. And it’s becoming more of “if I think this, so should you”. That’s not how it should be. Or what’s even worse, is that one person has an opinion and without even thinking if we believe the same, we just go along with it. I get that there are strongholds in peoples lives. We all have them. But why is it that one persons has to be another? Can’t we just come together and pray for that stronghold to be lifted in the name of Jesus? For that person to be free of that guilt or shame? I hope and pray that this doesn’t come off like I’m above anything. Or that I love to shop. That’s not it at all. And I get that some people could say “well you’re exactly who needs to find more in life than a Target run”. Which my response would be: I do. I’ve got a hunk of a husband who I love with all my heart. I’ve got the worlds best baby girl who I couldn’t imagine my life without. I’ve got the funniest dog you’ll ever meet. I have been saved by an immeasurable amount of grace, by a God who loves me. I’ve got struggles too, but a Target run isn’t one of them. If you’re days are filled with love and laughter. I think you’re doing it right. I think that you’re life is perfect, just like mine is for me. And that’s where we need to get to. Realizing that what we have, right in front of us is perfect. Not what we see on a tiny square on the Internet. Our house is enough, our clothes are enough…we are enough. So here’s to being nice to people. Here’s to lifting people us, whether they love Target runs or not. And here’s to being careful with what we bash online because you never know what it could mean to someone else.